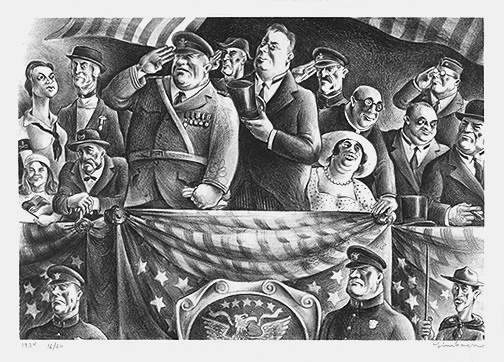 Reviewing Stand - - 1934, Lithograph. Edition 50. Signed, titled, dated and numbered 16/50 in pencil. Image size 9 7/8 x 14 1/4 inches (251 x 362 mm); sheet size 11 1/2 x 15 7/8 inches (292 x 403 mm). A fine, rich impression, on cream wove paper, with full margins (5/8 to 1 inch), in excellent condition. Reproduced: Representing America: The Ken Trevey Collection of American Realist Prints, University of California, Santa Barbara, 1995; The American Scene on Paper; Prints and Drawings from the Schoen Collection, Georgia Museum of Art, University of Georgia, 2008. 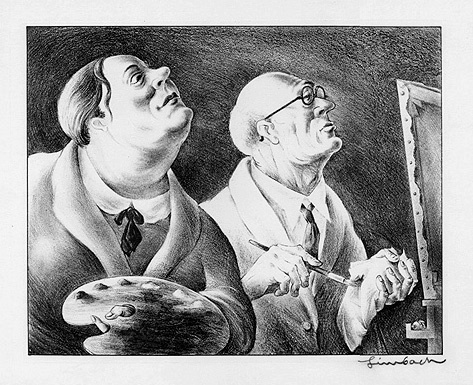 Student and Master - - 1934, Lithograph. Image size 8 15/16 x 11 3/16 inches (227 x 284 mm); sheet size 12 15/16 x 19 11/16 inches (329 x 246 mm). A fine, rich impression, on cream wove paper, with full margins (2 to 4 3/8 inches). Three short (1/4 inch) repaired tears in sheet edges, a diagonal crease (11 1/2 inches) across the bottom right margin, well away from the image, otherwise in excellent condition.